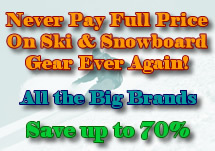 Snowboard and ski advertising is available on Powderhounds.com. We offer advertisers the ability to post banner ads on various zones (segregated by geographic regions) around the website to heighten brand awareness, generate qualified visits to their website, and to acquire new leads and customers. Powderhounds.com provides a number of affordable ways of promoting your brand and attracting qualified visitors to your website. Powderhounds.com received 300,000 visits in January 2018, and 2 million visits per year. We don't have snow reports on the website (which just generates lots of repeat visitors); our visitor traffic is made up of people proactively searching for information we have on our website. Powderhounds.com also has a strong social media presence with 27K followers on Instagram, 18K followers on Twitter, and 10K Facebook followers (page and group). Percentage & volume of geographic visits vary depending on the season. More stats can be provided upon request...enquire here. Rotating banner ads are image-based ads that appear in a prominent position on all content pages of Powderhounds.com; e.g. http://www.powderhounds.com/NewZealand.aspx We also run internal banner ads in these positions however links from these banner ads are directed to your website. For example you might just want to your ad to appear on our Chile pages and only display to people browsing from the United States, or you might want to target all the South American pages and show your ads to everyone apart from people in the US. Each ad is assigned a weighting (1-10) based on the agreed cost per click and CPM combo. No listings were found for Advertising.